We just observed the celebration of Govardhana-puja or the worship of a special mountain in Vrindavan, India (the land of Krishna’s birth or appearance) which is considered non-different from Krishna. It is a festival of simple, though elegant pomp and gaiety that teaches us many practical lessons about living in balance with Nature and God. 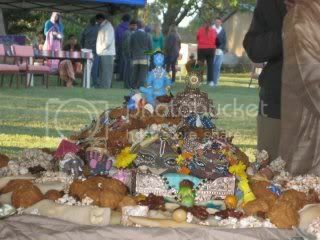 For the festival a hill of sanctified food (prasadum) is created with Krishna on the top to recreate the hill. These festivities commemorate this occasion, and help us meditate on its meaning. We hear about what happened, along with plays reenacting it, worship of the cow, and circumambulating the hill as was done 5,000 years ago. We also pray to enter into the deep, yet simple, essential message of this blessed event. This worship of Govardhana Hill symbolizes the ideal life—both rural and simple—yet opulent in natural gifts, centered on cow protection, brahminical (spiritual) culture, farming and worship of God by showing gratitude for his many natural gifts. We are thus encouraged to live a healthy life centered upon love and service of Krishna in harmony with Nature. This pastime or lila of Krishna covers four chapters in the 10th Canto of Shrimad Bhagavatam. 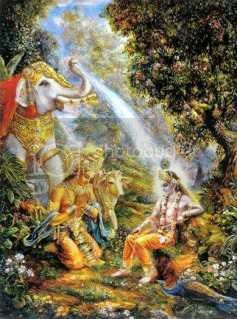 Through this and all the adventures or pastimes of Krishna we are given a glimpse of the eternal spiritual world. Krishna pastimes on this planet are like a sample spiritual world and are recorded in the pages of the Bhagavatam. We recall these lilas by hearing and discussing them, and thus we can fix our mind on Krishna. Whatever place is associated with God is transcendental, even though it occurs apparently on this planet. It is Krishna’s special mercy that he comes here to teach us how his eternal associates live by loving and relating to him. 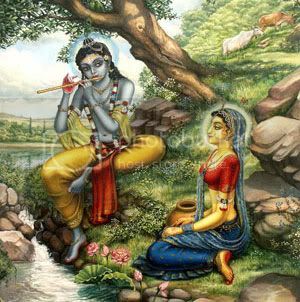 When Krishna comes to protect his devotees from feeling acute separation in his absence and to reestablish religion he also accomplishes many tasks simultaneously. Krishna is the supreme multitasker, but only he can do this without anything lacking in his many purposes. Some of the purposes leading up to and during the lifting Govardhan were to demonstrate that Krishna’s devotees don’t need to worship any other divinity or deva (empowered god) for their necessities. Indra, the king of heaven had become proud and conceited with his power (not recognizing that Krishna was God), and he was shown dramatically that his power was dwarfed by Krishnas. 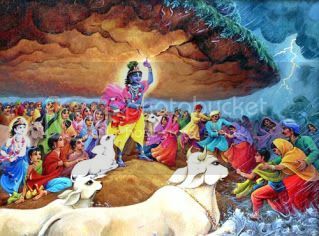 When Indra heard that Krishna had stopped a ceremony to glorify him and was instead worshiping Govardhan hill, Indra tried unsuccessfully to destroy Vrindavana and its inhabitants by intense thunderstorms of wind and rain usually reserved for supreme devastation. It is described by Jiva Goswami that not even a leaf fell from a tree on Mt. Govardhan. Coming to his senses Indra offered praise of Krishna’s power and glory and prayers for forgiveness. This is a lesson for all of us about the possibility of forgetting that whatever we have is by the grace of God, and we should never think we are independently great and powerful.